Romeritos is a Mexican dish from Southern Mexico, consisting of sprigs of a wild plant known as seepweed (Suaeda spp.). In Spanish it is known as romerito. That name in English means "little rosemary", but seepweeds do not resemble such plant. 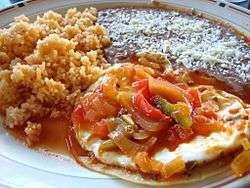 Usually, they are served with patties of dried shrimp, and potatoes in a mole sauce. They are traditionally enjoyed at Christmas and Lent. ↑ Tinoco, Armando (23 December 2013). "What Are Romeritos?". Latin Times. Retrieved 6 July 2015. ↑ "Romeritos with Shrimp Cakes". Saveur. 27 November 2007. Retrieved 6 July 2015.